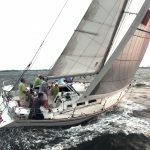 The City Island Yacht Club cordially invites all cruisers, day sailors, and racers alike, to come out for five, relaxed Sunday jib and main races. (Do as few or as many as you like.) The races will be short, approximately one hour, and the courses will be triangles. No windward–leeward courses and no spinnakers. Also, no poling out jibs or genoas with spinnaker poles or whisker poles. Non-racers and racers are encouraged to bring family members, sailors and non-sailors. There will be a long start line with plenty of room for everyone to start. The start line will be between buoy RG “CL” in Eastchester Bay, also known as EBYRA mark “C” and a boat with yellow flag. You will not be able to miss it. The committee boat will monitor VHF channel 71. There will be an informal get-together on the City Island Yacht Club dock after the race, with beer, soda, and snacks. Results will be announced. Boats will be scored PHRF, and racing boats will be scored separately from cruising boats. If you don’t have a PHRF certificate, we’ll figure out what your rating should be. There is no entry fee. If there is a NOAA small craft advisory in effect as of 10:00 a.m. on the day of the race, the race will not be held. If you want to come out, contact Jim Dennis at jimandlaura45(Replace this parenthesis with the @ sign)gmail.com or 914-961-3847. We will send you a course sheet, instructions, and answer any questions. Instructions and course sheets are also available at the City Island Yacht Club website. Instructions and course sheets will also be available the day of the race from the committee boat. 1. The Racing Rules of Sailing 2017 – 2020 and these Sailing Instructions shall govern the series. In case of conflict, these Sailing Instructions control. 2. No spinnakers, and no spinnaker poles can be used. No poling out of jibs or genoas allowed. 3. The start line shall be between an orange or yellow flag displayed on the committee boat, and buoy RG “CL”, also known as EBYRA mark “C”, in Eastchester Bay. 4. Course: The course shall be from the start to EBYRA mark “R”, then to buoy 46A, a/k/a EBYRA mark “L”, then to EBYRA mark “C”, then to EBYRA mark “R” then to EBYRA mark “L” then to the finish. The finish is between the committee boat and the “C” mark. All marks to be left to port. At the finish, leave the committee boat to port. A course chart is enclosed. EBYRA mark “R” is a yellow cylinder. Marks “C” and “L” are government marks. Depending on conditions, the Race Committee may elect to use a short course. If so, an announcement will be made on VHF channel 71 no later than five minutes before the start sequence commences. The short course is: start to EBYRA mark “R”, then to EBYRA mark “L” then to finish. All marks to be left to port. At the finish, leave the committee boat to port. 5. All boats will be in division number 1. Numeral pennant “1” (red dot on a white field) hoisted, one sound, 5 minutes to start. Numeral pennant “1” lowered, one sound, start. 7. The Race Committee will endeavor to announce the starting sequence on Channel 71. All competitors are urged to monitor VHF channel 71. Remember, commercial vessels monitor channel 13 and will use that channel to communicate if necessary. 9. The race will not be started after 4:30. 10. Any competitor that does not finish the race within 1 hour and 45 minutes from the start will be scored DNF. 11. Scoring will be PHRF, time-on-distance. 12. Welcome: There will be soda, chips and beer available at the City Island Yacht Club dock after the race. The race committee will endeavor to announce results at that time. If possible, please moor at your regular mooring and take a launch to the dock. Many of our guest moorings are booked well in advance. 13. Safety: The safety of each yacht and her crew is the sole responsibility of the yacht’s captain/owner. Each yacht and her crew, by participating in this race, agree to do so at their own risk and waive any claim against and hold the race committee, the City Island Yacht Club, its officers, directors, committee members, employees and agents harmless against any claims arising in any way out of participation in the race by such boat and its crew. 14. CANCELLATION: If, as of 10:00 a.m. on the day of a race, the NOAA has posted a small craft advisory, the race for that day will be cancelled. 15. The mark positions are approximately as follows. No warranty is made as to exact mark locations.